On 12 Oct 1875 crown allotment 116 in the Parish of Pakenham was selected by George Bullen, a Melbourne solicitor of 13 Swanston Street. Mr Callanan, the surveyor, described the land “as very poor land except on the creeks where it is pretty good, tho' scrubby, a loose slate, sandstone on the ranges.” On 1 Jun 1876 George Bullen was granted his lease for the 19a 3r 24p under the 49th section of the Land Act 1869. On 15 Apr 1878 he wrote to the Commissioner of Lands asking them to put it up for sale by auction, a regular procedure where the lessee was generally the buyer at the upset price of £1 per acre. George Bullen wrote in his letter that he had fenced the allotment and cultivated about five acres thereof and erected a house and buildings thereon. He valued his improvements at £225 at least. On 20 Aug 1878 Bullen was issued a Crown grant to the property. George Bullen stayed in the area for a few more years, when he offered his services to the Berwick Shire Council as Shire solicitor. His offer was declined. The Upper Beaconsfield property was transferred to Thomas James Crouch on 25 Nov 1885. Crouch was councillor of the Borough of St Kilda 1867-72 and mayor 1870-71. He was born in Hobart on 22 Dec 1832, the eldest son of Thomas James Crouch and Sarah Rothwell. His father was deputy sheriff in Hobart. The young Thomas James Crouch trained as an architect, and arrived in Victoria in 1852 to try his luck on the goldfields. In 1854 he commenced business as an architect in Swanston Street, Melbourne, and in 1858 he went into partnership with Mr Ralph Wilson to form the practice of Crouch and Wilson, one of Victoria’s leading 19th century architectural practices. The firm’s work included such landmark buildings as the St. Kilda Road Asylums for the Blind and for the Deaf and Dumb, the Prahran Town Hall, the Methodist Ladies College and numerous ecclesiastical buildings for most of the religious denominations across Victoria. Crouch and Wilson won the first part of a competition described as the “architectural design” for the Melbourne general Post Office, but the government adopted the second-placed design of A E Johnson, which caused a scandal. On 16 May 1857, Thomas James Crouch married Mary Emma Bloor Turner (known as Emma), who was also born in Hobart. Her father was the Reverend Nathaniel Turner, who was a Methodist missionary in Australia, New Zealand, and Tonga. It is through this family connection that our Fassifern got its name. The origin of “Fassifern” may not have been of any interest to the Crouch/Turner family—they may have simply liked the name as Martha Kent named one of her sons Fassifern. Another of Emma’s siblings had a property in New Zealand also called Fassifern. A translation of the Gaelic fasadh fearna is “place of the alders”. The alder is a tree in the birch family. Mrs R.G. Casey is rebuilding Fassifern in 1913. Upon T J Crouch’s death in 1889, his widow Emma became the owner of the property, which was valued at £1330 in his probate. During holiday periods the house was sometimes advertised as a furnished cottage to holiday makers. On 12 Oct 1904 Emma Crouch died, and the house was passed on to her children. Ernest William Marston Crouch (son) and John Waterhouse Eggleston (son-in-law) were the executors of the will and the property was advertised in the Age as an executor’s sale on 14 Nov 1905. The house was now only valued at £350 with contents valued at £57.9. The drop in value may be attributed to the 1890s recession, or the house may not have been maintained. What happened at this sale is unclear, as the Crouch family continued to pay the rates and the title of Fassifern was not transferred to the next owner Richard Gardiner Casey until 18 Oct 1912. 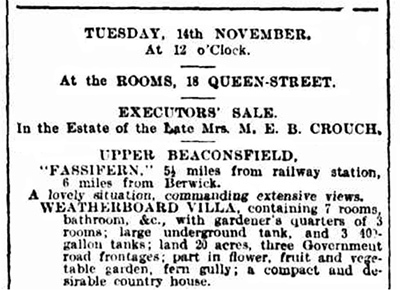 On 18 Sep 1913 the Punch newspaper reported that Mrs R. G. Casey was building a house at Upper Beaconsfield. It is not clear if the Crouch’s house was derelict at this stage or if it had been damaged by fire. There was a bush fire earlier in the same year that may have damaged some fencing of 'the Casey property', but this may have been his brother Sydney Casey’s property rather than Richard Casey’s. Sydney Casey owned “Windarra” and other pieces of land at this time. There were no reports of houses being lost. The Berwick Shire Rates books are inconclusive as the property was rated as having an annual value of £20 from 1897 until the year Richard Casey died in 1919. In Charles Wilson’s notes there is a reference to Kath Roberts, the postmistress of Beaconsfield, claiming that her husband Herman Roberts and his business partner built a new Fassifern just after the First World War. As the article in Punch indicates, it is likely that the house was built before the war. The Caseys travelled widely, and it was on the return from a trip to England that Richard Gardiner Casey took ill with bronchial pneumonia, and had to disembark at Honolulu, where he died a few days later. Richard Casey left substantial assets to his widow and sons; to his brother Sydney Cornelius Casey he bequeathed his lands at Fassifern Upper Beaconsfield and the buildings thereon. The property was valued at £425. Henry Britain Denniston, a lay preacher, and his wife Stella Thompson Denniston bought Fassifern in 1919, and according to family sources, “the new home was large enough” for the family of five children at this stage. Three more children were born to the family, two of them at Fassifern. Initially the title was in Henry’s name, but transferred to Stella in late 1921. With the new owners the net annual value of the property was increased substantially to £75. The Dennistons employed an Irish couple, William and Mary Millar, as caretakers, who continued their employment with the next owners, the Walkers. In May 1925 Charles Roy Walker and his wife Annie Margaret Walker bought Fassifern, but the title of the property was not transferred until 23 Feb 1927, which was probably the date when the final payment was made. The Walker family had three children, Nancy, Audrey and Roy. They remained in Upper Beaconsfield until 1959. The Walker family recall that when they took over the property in 1925 it had a small pavillion and a tennis court. It had well established paths and quite mature pines and cypress trees. Roy Walker enjoyed gardening, and spent most of his weekends working in the garden, keeping it in very good order. From 1925 to 1927 the Walkers used Fassifern as a weekend property, and 1927 decided to move to Upper Beaconsfield permanently. The Millars cared for the property during the week, assisting with cooking and other tasks at the weekend. 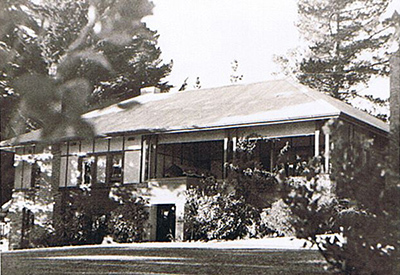 Mrs Walker enjoyed "Fassifern" as a house, with its big windows and verandahs, and appreciated the site with its lovely broad views, tree ferns and a small stream in the gully, which was crossed by several small bridges built by her husband, who also enjoyed making concrete steps and edges for paths. Mrs Walker was fond of swimming, so a small dam was converted to a swimming pool, and concreted by Mr Walker, who also built a concrete race with cleaning sumps to supply the water. The Walkers built the cottage as a play room for the children and later using it as a dance room, and visitors' accommodation. Roy Walker made several modifications to the house including an additional bathroom on the eastern verandah by cementing the floor and walls, he also made a bedroom and a darkroom under the house, which was used as a garage in Denniston's time. He was an enthusiastic photographer. He also built several small aviaries on the property. The Walkers lived in Fassifern until 1959, when they relocated to Blairgowrie in Berwick. Alison Billing, of Pine Acres, Sugarloaf Road, bought Fassifern on 17 Nov 1959. The Billing family, Alison and her daughter Jennie (Vaughan) and Alison's husband Arthur had lived in Upper Beaconsfield since 1949. In 1962 they subdivided the property into five blocks—4 small blocks along Reed Avenue, and the 5th block was the main Fassifern property. Arthur George Billing was a Shell executive, and on his retirement they decided to raise chicken for Golden Poultry. Around 1960 he removed the old wattle and daub cottage and built a large enough chicken house for 7000 chickens. As chicken raising proved a successful enterprise, Arthur Billing built a second chicken house for 13000 chickens in 1965, and a further shed for 17000 chickens in 1970. 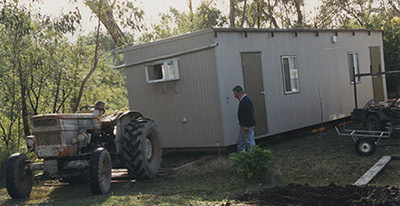 Having established a viable farm and business, the Billings decided to retire to Mathoura NSW. Ian and Laurel Harris, the new owners moved into Fassifern in January 1979. Ian Harris recalls: "We rebuilt much of the main house and outbuildings over our years, filled in the old clay bottomed pool and moved the old pool pavilion up to the west lawn and built a new concrete pool there. The tennis cottage and other small cottage remained intact save for a new roof and the rebuilding of the old garage. After Ash Wednesday, the garden was replanted where burnt, and some old Cypress trees removed near the house." The garden and pavilions are covered by a Cardinia Shire heritage overlay. "In 1983, Dr Charles and Yvonne Wilson lived in our Tennis cottage immediately after the fires, whilst Charles operated his valuable medical practice in two relocatable "site offices" donated by Wreckair Hire. Following the Wilsons, were the Eakins who had also lost their home in Stoney Creek Rd, and then later, Dr George Silberbauer." The Harris family continued raising chickens until 1996, then re-aligned the boundaries of the five lot title. On the main lot, where Fassifern stands, a conservation area with a Trust for Nature covenant was established in the gully. The Harris' sold Fassifern in October 2003.